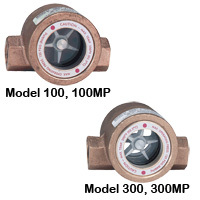 Sight Flow Indicators are local visual indicators of flow rate. Viewing windows at economical prices that are easily replaceable and serviceable. 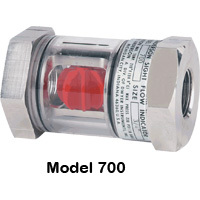 MIDWEST Sight Flow Indicator are a dependable service at economical prices. All types feature a removable window for easy service. 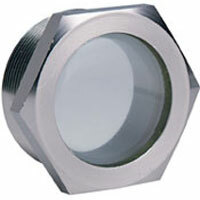 Sight Window has a tough tempered glass window that resists chemical attacks and abrasions. Applications include pressure vessels, coolant tanks, and oil reservoirs. Sight Window has fused glass style sight windows which feature glass to metal bond for reliability. Windows are clear and flush with front face. MIDWEST Sight Flow Indicator has a double window with no moving indicator and the window is removable for easy service and replacement. 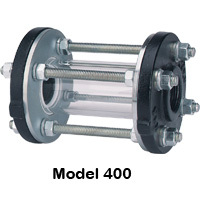 MIDWEST Sight Flow Indicator has a glass tube construction offering easy flow viewing. These models are manufactured of quality materials and safety tested to assure long, dependable service at economical prices. 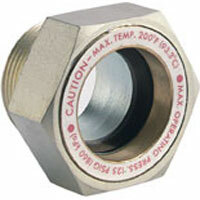 MIDWEST Sight Flow Indicator offer threaded process connections. Maintenance is simple with internal wipers. Economical. If a customer complains the impeller in his sight flow indicator is not turning, what is most likely the problem? Usually the impeller is fouled or the indicator is doing its job and actually indicating no flow. If a customer claims the plastic impeller dissolved in plain water, what probably happened? The customer exposed the sight flow indicator to fluid temperatures of 400-500 degrees Fahrenheit, considerably in excess of the published temperature specification. I see that the SFI-300 MIDWEST Sight Flow Indicator has a flow direction shown as an arrow. What will happen if water flows in the opposite direction? Will the rotating impeller rotate in both directions? I want to use the indicator on a wakeboard boat to show water being pumped in both directions on a wake ballast system. 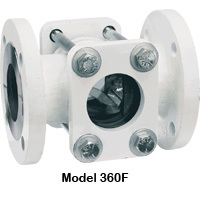 The inlets and outlets for SFI-300 are designed for flow to only be in one direction. You could physically push flow in the opposite direction, but you would risk damaging the impeller, and you would not get a true indication of flow.